The Binomial, Negative Binomial, and Poisson Distributions are closely related with one another in terms of their inherent mathematics. However, they are distinguished from one another due to the fact that they are better applied in situations suitable to them. 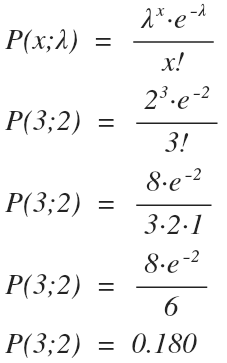 I will attempt to provide as simple a comparison between these three probability distributions in order to fully recognize their usefulness and their closeness. Binomial Probability Distributions are one of the many Discrete Probability Distributions – the random variable X only possesses discrete values in its data set (i.e., X = 1, 2, 3, 4, 5; certain values from a finite set) – that have been created and one of the most popular. In order for one to use a Binomial Probability Distribution (or BPD for short), one must first understand what Binomial experiments are, better known as Bernoulli Trials. an experiment consisting of n repeated trials. having each trial posses two and only two outcomes, often labelled as success or failure. the probability of success is denoted with p. the probability of failure (or no success) is denoted with q where p = 1 – q.
having each trial being independent. Therefore, the result of the any trial does not have any influence in the outcomes of any subsequent trials. it can be filled as many times as one wants. it possesses only two possible outcomes: heads and tails. each outcome from a flip of the coin will have no effect on the outcomes of future flips. Since this particular scenario is considered a Bernoulli Trial, it can be analyzed with a Binomial Probability Distribution. Let’s pose a question, what is the probability that 3 heads will occur out of 5 coin flips? b(x; n, p), stands for the binomial probability distribution function. Therefore, the probability of 3 heads occurring in 5 trials is 0.3125. Negative Binomial Probability Distributions are similar to that of the previously mentioned distribution, apart from the one detail that makes its experiments different from that of a Bernoulli Trial. Returning back to the Coin-Flip experiment. The question is, if one continues flipping a coin, what is the probability of heads landing 3 times? the experiment consists of repeated trials until heads lands 3 times. the trials are independent, as getting a heads on one trial does not affect the outcome of the next and following trials. the experiment continues until a fixed number of successes occurs, for example, 3 heads. b*(x; r, p), stands for the negative binomial probability distribution function. Therefore, the probability of 3 heads occurring in 5 trials is 0.1875. A cool note: in situations where r=1, you get the formula for the Geometric Distribution Function, which is essentially a specific case of the Negative Binomial Distribution Function. Poisson Probability Distribution Functions are once again another type of Discrete Probability Functions. While Poisson experiments are similar to Bernoulli Trials in that only two possible outcomes exist, the similarities end there. by the probability of success occurring is proportional to the size of the region (and therefore the probability of success occurring in an extremely small region of space is virtually zero). λ, is the average number of successes that occur in a region. x, the actual number of success that occur in a region. An example, a real estate company sells on average 2 homes per day, what is the probability that exactly 3 homes will be sold tomorrow? λ = 2, where 2 homes are sold in a day, where “a day” is the region in which the successes “2 homes sold” occur. x = 3, assuming that 3 homes are sold tomorrow, what are the chances of this event occurring within the region of a day? Therefore, the probability of 3 homes being sold tomorrow is 0.180.
p = is the probability of a success of occurring. Essentially, λ is the Expected Value of a Bernoulli Trial. The Poisson Distribution Function is nothing more than a specific case of the Binomial Distribution Function by where n is a large number, and p is a very small number. Another example: a certain drug is effective in 98% of cases. If 2000 patients are selected, at random, what was the probability that the drug was ineffective in exactly 10 cases? Therefore, the probability of the drug being ineffective in exactly 10 cases is 1.2276*10^-8. Contact – Probable Impossibility or Improbable Possibility?